Decorative stone elements create interest and add personality, as in this example by Countryside Flower Shop & Nursery, in Crystal Lake. Picnic and barbecue season is finally upon us, so it’s time to start planning for some great outdoor gatherings. If your backyard gathering spaces need a little help to become a perfect summer hangout, here are a few ideas to help you re-design your property and start building the backyard of your dreams. When it comes to creating a beautiful yard, it’s important to first think about the look and feel you most desire. The goal is to create a welcoming space where people want to hang out, but you also want to create a space that fits your personal tastes and your lifestyle. Experts at the local garden center can help a homeowner to identify factors such as sunlight, traffic flow, drainage and architectural style – which all provide important clues to getting started. 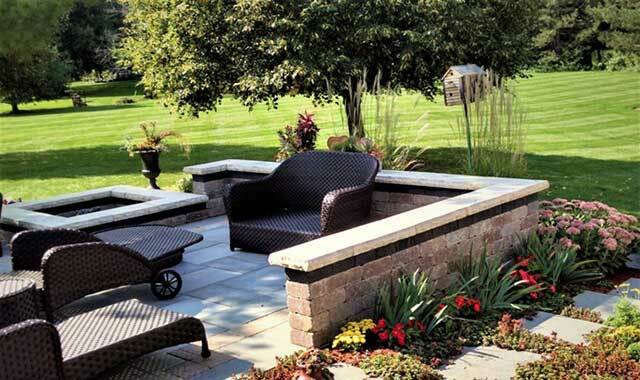 Providing ample seating is a good way to start enticing guests to your landscape. Try adding some benches and Adirondack chairs that provide both comfort and variety, says Kindinger. If space allows, match them with couches, chaises and hammocks. Consider additional features such as versatile patio tables and related seating. Strategically arrange plants in colorful and bright planters, and set up a few whimsical pieces that make for good conversation starters. Adding a bit of mystery is always a good idea. Introduce features just off the patio or deck that beckon people to get out and explore the yard. “Paths that lead to different parts of the yard are great,” says Kindinger. Serious outdoors entertainers are creating the ultimate enticement by installing full outdoor kitchens, complete with breakfast nooks, wood-burning pizza ovens and covered patios that have elegant mood lighting. Kim Hartmann, landscape designer and horticulture educator at Countryside Flower Shop, believes it’s important to build your outdoor spaces around your own personal style. Play into your preferences for something formal, contemporary, cottage-like, eco-friendly, tropical or Zen. The more of a personal twist you can offer, the better. “Use hardscaping materials that maximize your time spent with friends and family, and outdoor garden decor that adds whimsy, character and focal points in your outdoor spaces,” Hartmann adds. Some landscape designers are getting their clients back to nature by lightening the mood in the backyard. Features like a rock, meditation or Japanese garden can bring a sense of serenity into the yard. In another twist, try adding to the appeal of your yard by installing some decorative rock and stone elements, says Sean Ducey, garden manager at Whispering Hills Garden & Landscape Center, in Cary. Water features can take many forms, with ponds, stacked stone waterfalls, focal point fountains and smaller waterfalls being some of the more popular choices. Of course, some homeowners opt for choices like hot tubs, patio fire pits and patio fire bowls – all of which draw people together for a summer night under the stars. Your flower choices reflect your personality and lifestyle a lot more than you might think. “Personalize your choices of plants that invoke positive feelings and memories,” says Hartmann. Several popular choices can add some oomph to your yard. One of this year’s big sellers is calibrachoa, a good container plant also known as the mini-petunia or “million bells.” It comes in a rainbow of colors and blooms all summer long when placed in full sun. Hartmann also suggests lantana, a plant boasting multi-colored clusters of flowers that come in shades of yellow, orange and pink. The designated “hosta of the year,” World Cup, is a shade-loving plant that features bright-gold foliage and pale purple flowers that bloom from late June to early July. The more casual gardener may prefer a high-impact and low-maintenance plant like Dragon Wing Begonia, adds Hartmann. Featuring glossy, wing-shaped leaves in emerald green or bronze, this begonia blooms all season and produces red, coral, pink and white flowers. Of course, something a little more exotic can create interest in a garden, too. Countryside Flower Shop carries a wide variety of rare trees and shrubs, tropical varietals, and more ornamental selections like Japanese Maple. Ducey adds that hydrangeas, shrubs and ornamental grasses are easy to incorporate into the backyard, and they provide interesting foliage. He and Hartmann both are fans of allium, an ornamental member of the onion family. It’s easy to grow and boasts a lengthy bloom time. It’s also deer- and rabbit-resistant and is unique in appearance. Allium comes in several varieties, including versions that produce bold-colored flowers on a spherical head. Perhaps the easiest way to add pops of color into your backyard is by setting up miniature landscapes in containers. Get creative mixing up plants such as dwarf conifers, succulents, decorative stones, and small-scale perennials and ground covers. For an added flourish and a bit of whimsy, pop in a fairy or gnome figurine to make an “enchanted” garden. Nothing says summer like fun in the water and sun. Pools have a way of drawing people together, and they have the advantage of creating a beach-like atmosphere right in the backyard. Think of it as your own personal oasis with a fantastic lounging area. “It should be a destination, but also private,” suggests Kyle Ritchey, pool designer with Barrington Pools and Spas, in Barrington. Placement of the pool is an important consideration, too. It should be easily accessible from the house, but it shouldn’t bee too close, either. “You want to make it feel like a retreat, an oasis that you are going out to,” Ritchey says. Placing a pool too close to the house can actually feel confining. When designing the pool deck, Ritchey considers traffic patterns and the way people might navigate around the pool and other objects on the deck. For example, if you have a fire pit integrated into the pool deck, make sure there’s enough space not only for people sit, but to walk safely around the pool and pit. Complement the pit with a cozy and intimate setting where deck furniture and lounge chairs face one another. Some of the latest luxury pool decks are receiving built-in features such as tanning ledges, benches and bar stools – additional gathering places that entice people to hang out, but which also require new considerations for traffic flow. “Ultimately, this is a trend of creating a resort-style feel in the backyard,” Ritchey says. It’s a trend that hasn’t escaped the notice of Dennis Marunde, president of Arvidson Pools and Spas, in Crystal Lake, Palatine and St. Charles. Marunde sees more customers looking for in-ground pools that have sun ledges and beach-like entry, where the pool steps gradually from the deck into swimming depth. Features surrounding the pool deck can also make this an inviting escape. Sound, in particular, is often overlooked, says Marunde. Bluetooth-enabled audio systems are easy to use, increasingly affordable, and very effective if customized sound systems are outside the budget. It’s also become standard for professional pool builders to utilize energy-efficient equipment such as variable-speed and heat pumps; automatic covers; and LED lighting systems, which quickly enhance the ambiance during an evening event. The physical appearance of the pool is also important, and easy to take for granted. In this retreat-like pool by Arvidson Pools & Spas, in Crystal Lake, St. Charles and Palatine, seating arrangements provide small gathering spaces around the pool deck. Wider steps into the pool also make for easy entering and exiting – especially for grandparents and children. Safety should always be a priority, on the pool deck or on a patio. A professional pool design should start with adequate lighting and no-slip surfaces, says Marunde. Make sure surfaces won’t be painful when walked upon. Consider the safety of the plants on and near your pool deck, too. They’re likely to take more abuse than you may realize, and they can impact the maintenance of your pool. If you’re concerned about pool chemicals, alternatives to the traditional chemical sanitation systems do exist. Salt-based applications, in particular, are coming into vogue. If children or older adults will be around the pool a lot, consider installing wider pool steps that are easy to see and access, says Ritchey. Limiting the number of steps can help to avoid accidents while also allowing for more activity nearby. Creating an idyllic gathering space can sometimes feel daunting, but know that help is available. If you’re not feeling brave enough to tackle a project on your own, or you’re simply looking for ideas, a consultation with a landscaping professional should be at the top of your to-do list. Reputable local nurseries usually have someone on-hand. “Definitely talk to a designer for outdoor spaces, in order to get things done right,” says Ducey. Consulting with a landscape professional can help you not only accomplish your goals in a safe and efficient manner, but it can also produce a solid investment in the long run. This entry was posted on Tuesday, May 1st, 2018 at 12:00 pm	and is filed under Home & Garden, Top Posts. You can follow any responses to this entry through the RSS 2.0 feed. Both comments and pings are currently closed.